Call of Duty: Black Ops III just got a little bit more exciting. Treyarch has announced a brand new game mode for the upcoming FPS called Free Run. It'll be a solo experience on courses that are made up of challenges and puzzles that will test your movement and traversal skills. Even though it's a solo mode, it will still have an online element. You'll be competing against other players' best times on the online leaderboards. The new mode will be available at the game's launch, and it won't require any unlocking. If you need help with the new mode there will be a tutorial to assist you in understanding the movement in the game. There will be four courses which will steadily increase in difficulty. According to the developers, the course will become extremely difficult towards the its end. The mode was originally a development tool, but Treyarch decided to turn it into a game mode instead. Next, if you're a veteran Call of Duty player, you're in luck. 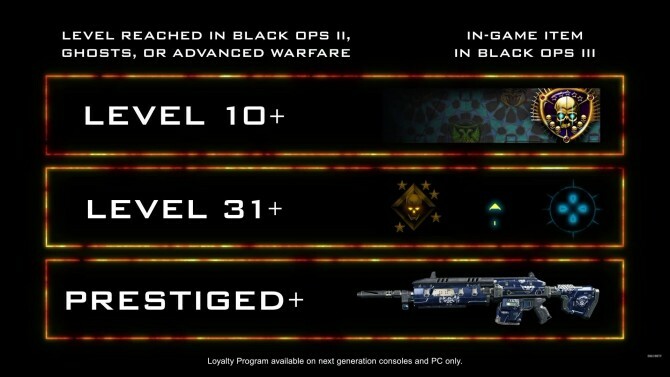 If you've played Call of Duty: Black Ops II, Ghosts or Advanced Warfare, you'll be able to link your account to the game's official website to receive in-game rewards in Call of Duty: Black Ops III. Unfortunately, the loyalty program will only be available on PlayStation 4, Xbox One, and PC. It will include eleven multiplayer game modes, along with Free Run and custom games. If you haven’t reached the levels shown above just yet, you still can before the game launches on November 6th across the three aformentioned platforms. Nauglamir and Deadpool like this.